There seems to be an endless variety of bathroom vanities – some more trendy and expensive than others. Regardless of how utilitarian you are while choosing bathroom furnishing, it pays to know what your options are. There are bathroom vanities that are mind-blowingly practical, others meant to be so aesthetically pleasing you want to live in your bathroom, and those that combine functionality and style. A remodeling contractor can help you narrow down your options based on the size of your bathroom, but it’s best to have a general idea of the types of bathroom vanities before a remodel. These types of sinks have been around forever, particularly in bathrooms with tight spaces. As the name implies, this type of sink is mounted on top of a porcelain-type pedestal, which conceals the plumbing supply lines. Depending on the design you’re going with, plus if you have a large bathroom space, you can install a pedestal sink so it becomes the focal point of the bathroom. It doesn’t usually come with a storage space for bathroom supplies, so you’ll have to figure out that part by installing something additional. Probably the most practical, and space conscious sink. But as lovely and practical as it is, it doesn’t have a lot of support, so it can also be the least durable bathroom vanity, since any accidental thrust or pressure can cause it to tilt or break. Some people don’t find it very attractive since you can see all the plumbing connections going into the wall (at least for the unevolved ones with no enclosures). These types of vanities are like your typical pedestal sinks, but differ in that they offer a bit of storage space. So they’re more utilitarian. They also offer the same aesthetic appeal as pedestal sinks, so it might be worth shelving out a few extra dollars for them. Is a premium type of sink, found mostly in newer construction/remodeled homes. It’s considered premium because it can’t be constructed without a solid surface counter – like granite or synthetic composites, which tend to be pricey. Since an undermount sink mounts from beneath, it can overhang over the bowl of the sink. Aside from making your bathroom look posh, the hard surface vanity base is durable and conceals plumbing supply and waste lines, so it’ll be your money’s worth. top, which is usually affixed to a floor mounted vanity base. The waste drain and faucets are non standard, so the type of bathroom vanity can only be installed during major remodeling projects or brand new construction. 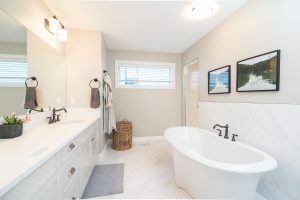 All in all – with the floor mounted vanity base, state of the art faucet and waste drain – this bathroom will require a ton of money, and a specific bathroom shape, so make sure you consult a remodeling constructor before deciding. Are extremely popular since they support most types of sinks, offer you a ton of bathroom storage space, and allow you to get as creative as your wallet will allow you in terms of design and cabinet countertop material (ceramic tile, granite, marble or plastic laminate). There you have it, these were the different types of bathroom vanities that are available. Some of them include vanity cabinets, free standing vanity sinks, wall mounted vanities, and much more. Remember there’s a subsection within each type, so be sure to not limit your options when you’re looking for the perfect vanity for your bathroom.